My vanilla socks were just plain stockinette socks with an eye of partridge heel, started last November when I was traveling in Germany. They hibernated for a little while and then picked them back up in the spring. I finished those pretty quickly and they’re quite a nice pair especially when paired with my birks. I used a yarn from Yarnarchy down in Portland, in the Liberty colorway. I really love how I can make a simple sock fun with hand dyed yarn. Last but not least are a pair of socks made with some random self-striping yarn I found in a bag of yarn that I’d purchased at Goodwill. I liked the colors and figured it’d be a nice yarn to do a simple pair. 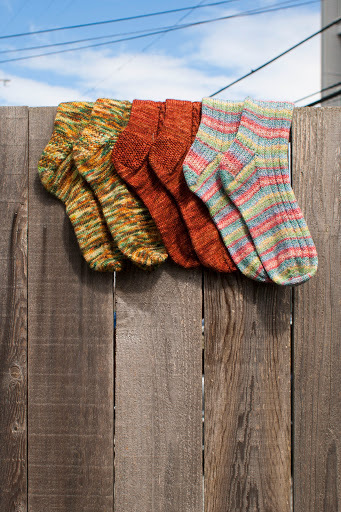 Originally I was just going to make these socks for the long-term planning box but one of my teammates asked (while I was knitting these at a pub) if I could make her a pair of socks as she goes on a spiritual pilgrimage. These were be gifted to her with love and good thoughts. Great socks. I like the way you took photos over the fence.